Having transformed Las Vegas with The Mirage, Treasure Island, and Bellagio hotels, Steve Wynn opened his latest creation, the Wynn Las Vegas in 2005. Wynn envisioned departing from the widespread trend of building “themed” resorts in Vegas. Instead, he wanted to transport guests from the bustle of the strip into a beautiful and luxurious world. The centerpiece of the Wynn Resort is the Lake of Dreams, by day an oasis for tranquil outdoor escape and by night a showcase of theatrical multi-media displays. With 4,000 underwater LED fixtures, the lake can be transformed into a blaze of color and patterns. Shortly after opening the resort, Wynn realized that, although spectacular in its scale and color, the lake was missing something. He wanted to enhance his centerpiece and asked Walt and his team for ideas. Over the course of numerous meetings with Wynn a variety of concepts were explored. At one point Wynn mentioned the enduring image he still had from the 1950’s French film The Red Balloon, in which a balloon takes on a personality and character of its own. That sparked the idea of creating two spheres that could magically move and dance, with light and music, across the surface of the lake. The sphere’s movement could be coordinated with the lake’s 4,000 LEDs to appear as though they were painting on the lake. These two inanimate “orbs” could also be imbued with an endless array of personalities to create the magic and wonder Wynn was looking for. With a concept in hand, the biggest challenge was how to make 4 ft. spheres, along with their internal lighting, move about the lake with only 30 inches of water to work in. Additionally, Wynn insisted that any additions to the lake be done without draining or modifying the lake itself because of its central place in the resort. 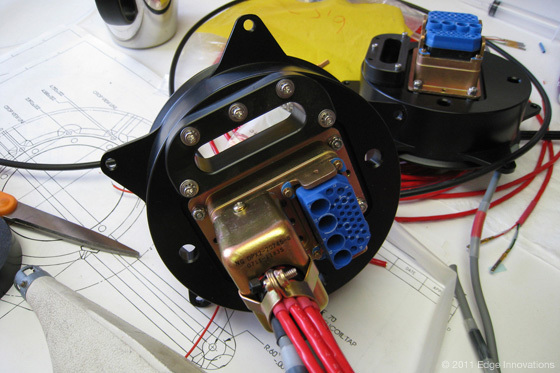 These rigid constraints prompted Walt and the team to come up with a novel concept that uses multiple servo-controlled winches attached to the spheres through underwater cables. By coordinating the various winches, the two spheres could move along the water. Further, by adding a vertical axis of motion the spheres could appear to hop and skip, as well as glide. 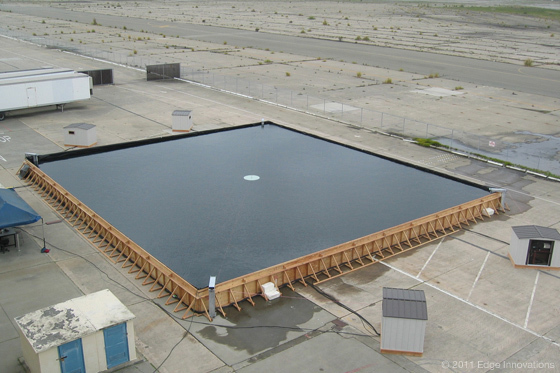 In order to develop and test the concept, a large tank was built at Edge’s facility to simulate the Lake of Dreams. 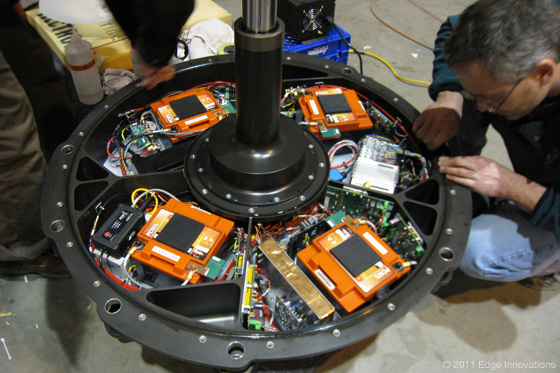 The fake lake was used to test different winch configurations, as well as the hydrodynamics of the underwater “sled” that supported the sphere and contained the onboard electronics. 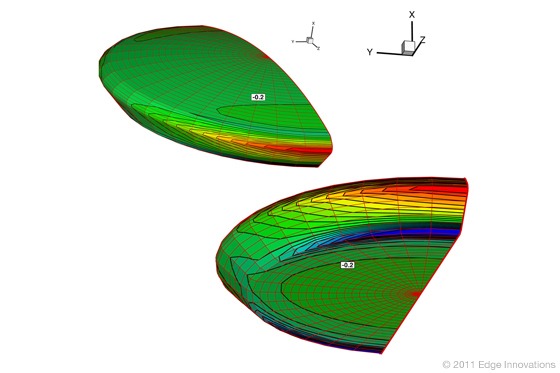 The sled had to be balanced and shaped so that it ran in plane (regardless of direction) without rising or diving, thereby creating the illusion that the sphere magically glides along the surface, even at speeds up to 10 ft/second. 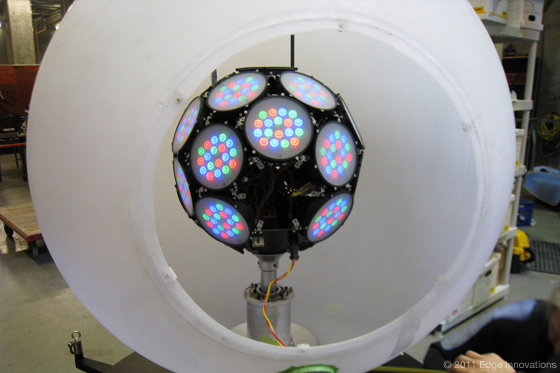 Extensive prototyping and testing was done to determine the optimal configuration of internal lighting. As envisioned, the Orbs were to glow magically in a mix of colors and patterns with no discernable light source. 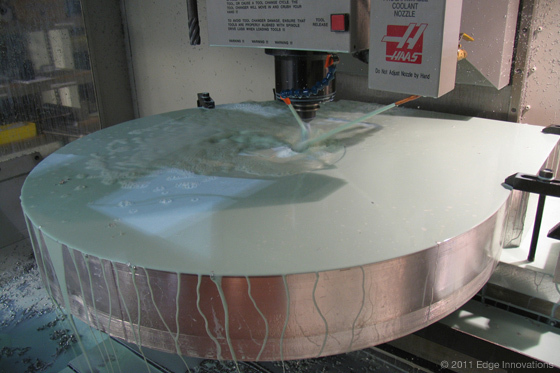 This required achieving just the right balance of diffusion between the 500 internal LED’s and the outer acrylic shell. To help convey a sense of character and mood, the Orb lighting was designed to modulate from a faint glow to a brilliant star-like brightness. 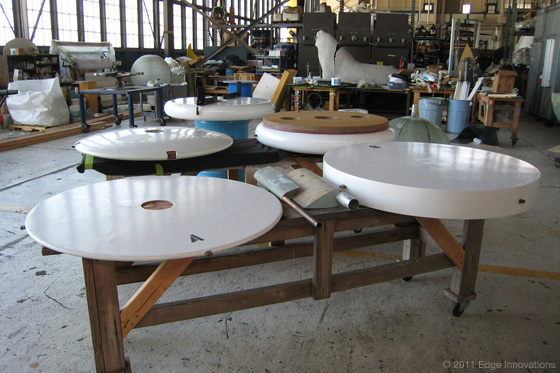 Because of the unique packaging requirements of the underwater sled, the onboard electrical and control system required the development of a large number of custom printed circuit boards. 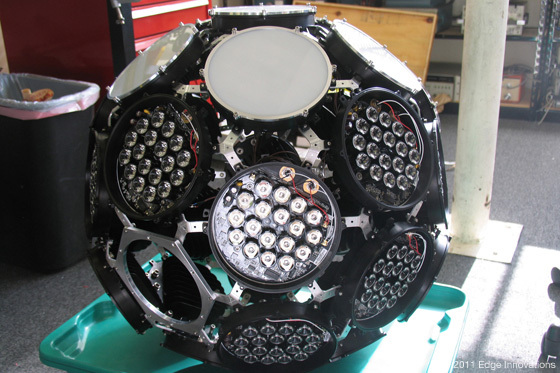 The self-contained, battery powered system not only had to control the onboard lighting and vertical movement of each Orb, but also had to communicate wirelessly with the ground-based master controller in order to synchronize the two Orbs and the lighting and audio of the lake. Significant design effort was also put into minimizing the weight of all structures and components so that the Orbs could achieve neutral buoyancy, and thus appear to be sitting on the water’s surface. The system had to perform reliably across the wide range of desert temperatures, from 120-degree direct sunlight summers to below freezing winters. 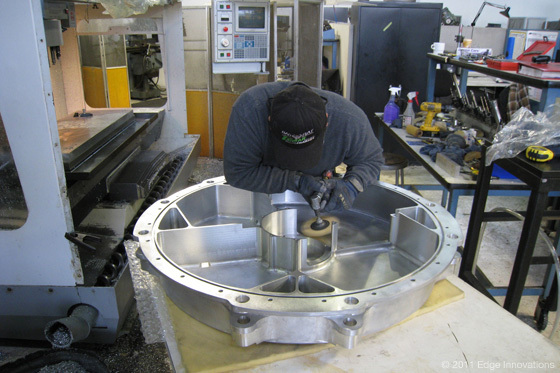 As part of delivering a turnkey system, the Edge team had full responsibility for the installation and integration of the Orb system into the Wynn facility (with servo-winches provided by Fisher Technical). Because of its central location in the resort, all work had to be done with minimal impact to the guests. Following installation and testing, a talented creative team was assembled to develop and program the first show. The team included choreographer Kenny Ortega (Director of Michael Jackson’s This is it), lighting designer Patrick Woodroffe (Rolling Stones, The Police), and Oscar-winning composer Michael Giacchiano (Up, The Incredibles). 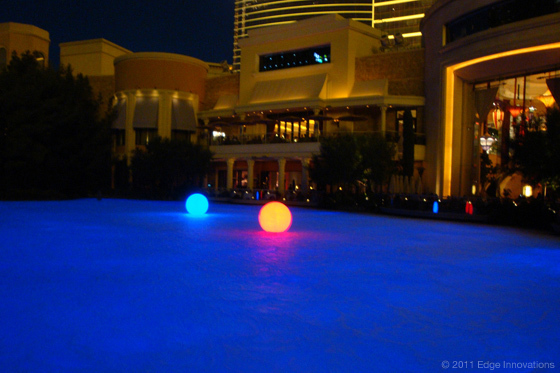 The Dancing Orbs have been performing nightly at the Wynn Las Vegas since opening in late 2008.